Expectations that the match would be an even contest were at the forefront of everyone's mind when the teams stepped onto a dry and worn East Melbourne Cricket Ground. The crowd was given much to cheer about from the moment of the opening bounce. The game was played at a hectic pace and due to the spirited performances of both teams neither was able to gain any real advantage. As soon as a player from one team won possession he was quickly pounced on by the opposition and brought down in his tracks. It made for crowded play and the frequent crush brought a growing dependence on the rucks. The preceding weeks had been played in driving rain and the conditions had caused the turf to be churned up beyond repair. Now dry, the well trodden heel marks that were left behind were now playing havoc with the bounce of the ball and causing the players all manner of problems. The promising start to the match then took a decided turn for the worse. Whether it was as a result of player frustration brought about by the irregular bounce, or as a result of the umpire's failure to intervene with regard to the strong work being done in the crush, the game turned decidedly bitter and ill-tempered. Blows were frequently traded and it appeared that some of the players may have had old scores to settle. With little football of any note played for the remainder of the term, only one goal was produced and the teams went to the first break with University leading by nine points. Play improved somewhat in the second term and both teams scored two goals apiece; Ogilvy and Fogarty kicked one each for University, while for Geelong, Eason scored with a magnificent place-kick from long range. Geelong's second goal came from the trusted boot of young Billy Orchard. At half-time, Geelong trailed by six points, but on the balance of play appeared to be playing the better football and looked the more likely of the two clubs to take home the victory. Of the University players, Edward Cordiner was showing the best form, while for Geelong, Henry Young was playing a determined game in the ruck and his great understanding with rover, Jack Hassett, was on full display. After the long break, the ill- feeling that had so blighted the first half continued unabated. Hassett soon went down with a severe ankle injury, and with him went much of Geelong's drive out of the ruck. The Geelong defence was now under siege, and though it held off countless attacks on goal, it eventually buckled under the pressure and conceded three goals in quick succession. Four unanswered goals by the University team made a big impact on the scoreboard and the teams went to the final break separated by a margin of 30 points. Hostilities broke out immediately on the resumption of play in the final term. The level of ill-feeling reached new heights of which the balance of blame was laid squarely on the men in black and blue. Blows were struck on four or five separate occasions throughout the term and it seemed that all regard for the ball was lost. It was the last thing that anyone in the crowd would have expected from the two teams as they made their way to the ground earlier that day, and when the final bell rang to signal the end of play there were few who were not glad of its arrival. Final score: University 9.9 (63) defeated Geelong 3.10 (28). University had now won each of its three encounters with Geelong since joining the League in the previous year. The Cordiner brothers were amongst the best for University - Edward in defence, Harry up forward. For Geelong, Henry Young has seldom displayed finer form throughout his distinguished career and was clearly his team's best player on the day. In what was an 'unusual and well-won complement', the Geelong crowd showed their appreciation for their captain's efforts in the fiery battle and chaired him from the ground. Geelong secretary, Charles Brownlow, was heard commenting after the match that he had never seen a 'dirtier game' in all the years he had followed football. A great rivalry quickly grew between the two clubs. University held sway for the first three years with victories in each of its first six meetings with the Geelong club. It would take until the round seven clash of the two clubs in the 1911 season for Geelong to gain its first win over the University club. 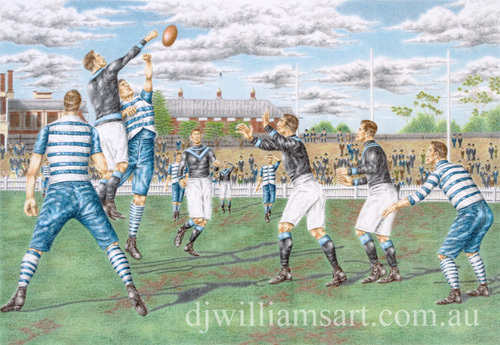 From there Geelong prevailed in each of their next seven games to make it eight on end before University disbanded prior to the start of the 1915 season. Of all the VFL clubs, University would suffer the greatest number of casualties in WW1.